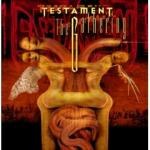 It's a hard road, as a fella named John Osbourne once sang, but the respect that Testament has gained over more than two decades of personal and creative ups and downs is well earned. Of all the bands to rise to prominence during the second wave of thrash metal in the late 1980s, Testament was the one that came the closest to joining the much-vaunted Big Four (do I even have to name them?) at the top of the American metal heap. They had all the right ingredients: a band that could easily go from full-on double-time speed to more introspective, melodically inclined fare, the songwriting skill to pull off such variety successfully, a flashy guitar shredder in Alex Skolnick, and most crucially, a vocalist in Chuck Billy who could combine rough, authoritative snarls with a keen sense of melody well enough to rival that of James Hetfield at the time. 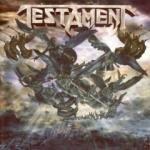 And for a while, from 1987 to 1989, Testament could do no wrong. 1987's scorching debut The Legacy, initially released on Metallica-launching indie label Megaforce, was swiftly picked up by Atlantic as the majors scrambled to find the next thrash sensation. Its follow-up a year later, The New Order, highlighted by a pair of ace singles in "Trial by Fire" and "Nobody's Fault" (the latter the greatest Aerosmith cover ever) clicked in a big way with the MTV-influenced metal crowd. Then, 1989's Practice What You Preach established Testament as a legitimate force, cracking the Billboard Top 100; creatively the band was in full throttle, coming up with more streamlined material while continuing to acknowledge its underground thrash roots. By 1990, the band had landed a pair of plum gigs: forming a formidable triple bill with Judas Priest, whose Painkiller had revitalized their career, and Megadeth, whose Rust in Peace was an instant classic; and later as part of the big Clash of the Titans arena tour, which also featured Slayer, Anthrax, Megadeth, and Suicidal Tendencies. The big time beckoned. However, Atlantic Records had other ideas. Of all the major labels to jump on the metal bandwagon, Atlantic had botched things the most during the late 80s, hyping mediocre pop metal bands like Rough Cutt, forcing once-respectable British band Raven to shamelessly sell out, and seeing bands that were at their creative peak, like Savatage and Over Kill, fail to chart highly. 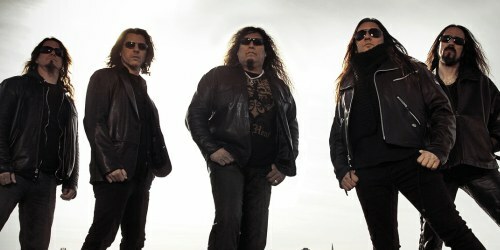 With Testament, the label felt pressure to milk the thrash trend as much as humanly possible, and the band was urged to get another record out quickly. However, with its fourth album in four years, Souls of Black (1990), the band had run completely out of steam, which was more than evident in the album's rushed, sloppily produced and arranged feel. Testament was out of gas, plain and simple, and many who had followed the band during its steady rise simply moved on to other, more cutting-edge acts. It's funny how time has a way of putting things in perspective. Eighteen years after Souls of Black's flop, Testament's reputation is as well-regarded as anyone's in metal today. Having slogged their way through the 1990s, going back underground and rediscovering what it was that made their music so great in the first place, putting out a latter-day album that many regard as their magnum opus, seeing one member defy the odds by conquering cancer, and eventually reuniting, leading up to a big 2008 with a triumphant new album, their first in nine years, along with a trio of key reissues, these five dudes find themselves besting those Big Four bands at last, both musically and in credibility. It’s a hard road, as a fella named John Osbourne once sang, but the respect this band has gained over more than two decades has been well earned. 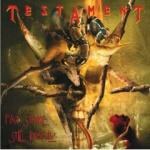 By 1997, Testament had righted itself with a pair of albums that marked a return to form, but major changes were afoot, both in personnel and in the music itself. After 1992's The Ritual, Skolnick and drummer Louie Clemente left the band, setting in motion a revolving door of musicians, which was only exacerbated when bassist Greg Christian left after the release of 1994's Low. With Billy and guitarist Eric Peterson the remaining members from that "classic" Testament lineup, the band's seventh album took a unique shape, one many were not expecting at all. Demonic (1997) remains an anomaly in the Testament catalog, often criticized and argued over by fans. With Skolnick's textured approach out of the picture, the band's riffs became much darker, leaning towards the more extreme sounds of death metal, to the point where guitarist James Murphy, who had played on seminal death metal albums by Death and Obituary, had been recruited to play on Low. On Demonic, Peterson's songwriting made the full leap from thrash to death, with Billy following suit in his vocal style. As a result, not only are the guitars heavier and much more physically punishing, but Billy's vocals completely eschew his normal versatile delivery in favor of a straightforward, monotone death growl. The gauntlet had been thrown towards the band's audience, and it was up to them whether or not to accept this more aggressive side of Testament. Eleven years ago, this new direction took some by surprise (this writer couldn't stand it at all at the time); today, it comes off as a relatively tame, but still surprisingly effective amalgamation of thrash and death aesthetics. Although Billy is at his best when he's doing his normal thrash vocals, his guttural bellow, which displays the ability to enunciate while conveying the brutality the genre demands, is still impressive. Peterson, meanwhile, is clearly having fun focusing on the tuned-down crunch of his riffs, anchored brilliantly by the massive rhythm section of bassist Derrick Ramirez (who had played in Testament's early '80s incarnation, the Legacy) and drummer extraordinaire Gene Hoglan, he of Dark Angel infamy. Largely an exploration of groove in an extreme subgenre, the songs on Demonic either cruise along at an Entombed-style "death 'n' roll" pace, or carry themselves with a swagger similar to that of mid-'90s Pantera. In fact, on the standout track "John Doe", the Pantera resemblance is uncanny: Peterson brings in a slight Southern sludge tinge to the guitars, while Billy tones down the growl just enough to add the slightest bit of Anselmo-like vocal flair. Meanwhile, "Murky Waters" cruises along at a ferocious pace, "The Burning Times" pulls off the same blue collar death metal sound that Kataklysm would make a living doing, and "Ten Thousand Thrones" is flat-out gargantuan. While it's clear that Testament's strengths lie in thrash, this death departure remains a fascinating one, an album that has aged more gracefully than many of its initial detractors, including yours truly, ever thought it would. One of this decade's most influential, controversial, and prolific black metal visionaries, Leviathan's hugely anticipated full-length boasts the cleanest production we've ever heard on a Leviathan recording. Multi-instrumentalist Wrest offsets his trademark tormented, misanthropic black metal arrangements with textured layering that gives the record a true sense of majesty, unleashing thrash riffs that give way to moments of ambient drone ("Receive the World"), and concocting instances of pure, primal, discordant genius ("Vulgar Aceticism"). It's a staggering, towering piece of work. Even better, though, is the 2005 debut album by Wrest's side project Lurker of Chalice, which has been reissued by Southern Lord. More atmospheric than the comparatively direct Leviathan, Lurker of Chalice explores the ambient side of Wrest's oeuvre, bringing in elements of doom, '80s goth, darkwave, and drone. Not surprisingly, the end result is much more varied, spacious, at times achingly beautiful, and incredibly, often even darker than Leviathan's black metal approach. It's not often we get an album that evokes classic elements of Fields of the Nephilim and Burzum at the same time, and we can only hope more Lurker of Chalice releases see the light of day. 1999's The Gathering is astounding for several reasons. 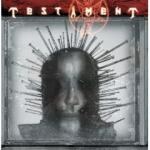 That Testament was able to return to classic form after the experimentation of Demonic is impressive enough. But considering how Billy and Peterson were able to recruit what amounted to an all-star lineup of extreme metal musicians, have the five of them display the kind of chemistry you'd expect from a band that had been together for a decade, and have the album turn out to be a career high point this late in their career, it all adds up to one special album. What was essentially a gathering of friends creating music for the hell of it (hence the title) turned into one of the best metal albums of the 1990s. A patchwork lineup like this should not have worked as well as it did (metal "supergroups" rarely do), but the way the five gel on record is amazing. Murphy continues his collaboration with Peterson on guitar, the pair now forming a potent combination. Steve DiGiorgio, whose smooth, nimble fretless bass work added an extra dimension to such great albums as Death's Individual Thought Patterns and Autopsy's Severed Survival, does the exact same thing on this record. And best of all, replacing the huge, jackhammer beats of Gene Hoglan is Slayer's Dave Lombardo, the greatest percussionist metal has ever known, whose trademark fluidity and groove dominates the entirety of The Gathering. As opposed to Demonic's rather scattershot approach, The Gathering is much more assured, finding a comfortable niche between thrash and death metal, best exemplified by Billy's vocals, which don't rely exclusively on that low growl. While his vocal work is still more aggressive than his late '80s output, this time his trademark charisma is ever-present as well, especially on tracks like "D.N.R. (Do Not Resuscitate)", "Allegiance", and "True Believer". Best of all, the other four members also elevate their games to match Billy's renewed energy. Lombardo locks "Sewn Shut Eyes" into a colossal groove, the stuttering, descending riffs by Peterson and Murphy sinking lower and lower. "Fall of Sipledome" opts for pure speed, while "Riding the Snake" is carried by DiGiorgio's jaw-dropping plucking, his melodic bass lines making an already superb album even more musically rich. The Gathering is essential listening and this reissue, with instrumental "Hammer of the Gods" tacked on as a bonus track, deserves to find an audience among younger listeners and neophytes alike. In 2001, cancer took its toll on the metal community, and especially on Testament. Not only was Death mastermind Chuck Schuldiner diagnosed with the disease, but both Billy and Murphy were as well, with Murphy's illness, which he eventually beat, forcing him to leave the band. That summer, the landmark benefit concert Thrash of the Titans was staged in Oakland, California, and not only was it a means for people to help out and pay tribute to Schuldiner and Billy, but it was also a celebration of the Bay Area thrash scene, as bands like Death Angel, Heathen, and Exodus all reunited. In addition, Legacy reformed as well, with Skolnick and Christian returning for the first time in nearly a decade. Sadly, Schuldiner lost his battle with cancer later that year, but Billy successfully fought through it, and that Legacy reunion served as the catalyst for a full-blown Testament revival, as Billy and Peterson welcomed Skolnick back into the fold, with Christian and Clemente following four years later. Atlantic prevented Testament from remixing material from its first two albums, and so in 2002 the band decided to re-record ten tracks from The Legacy and The New Order, as voted by its fans. Sentimentally this was a cool idea, but the cold, hard fact remains that very few re-recording projects by veteran bands ever work well, and First Strike Still Deadly certainly isn't one of them, as songs like "Trial by Fire" and "The Preacher" fall flat completely, and Billy doesn't display the kind of range that he did on the originals. The collection's one saving grace, though, is the band's enthusiasm, and while there was no way to reinvent those classic tracks, on the run-throughs of "Into the Pit", "Disciples of the Watch", and "First Strike Is Deadly", fans were served notice that the fire indeed still burns inside these old guys. It would take another six years before that long-awaited comeback album would ever appear. Which brings us to 2008, and the release of the hugely anticipated, massively hyped The Formation of Damnation. With Skolnick back for his first studio album since The Ritual in 1992, everyone expected a return to the early sound of Testament, and for the most part, that's what we get. With former Slayer/Forbidden drummer Paul Bostaph behind the kit this time around (the eighth drumming change in the band's history -- a Spinal Tap-like level of absurdity), the blend of midtempo groove and double-time thrash is emphasized, but it feels like Skolnick is still trying to regain his footing, the slick melodies and solos that defined his style nowhere near as prominent as Peterson's more robust approach. Consequently, as far as the guitar arrangements go, the late '90s feel still dominates. Still, this album is far from being a clunker, and the high points are outstanding ones. The swaggering "More Than Meets the Eye" is quintessential Testament, hearkening back to the days of The New Order, led by Billy, who has seemingly turned back the clocks, his spirited, charismatic delivery (punctuated by crowd-pleasing "whoa-oh"s) his finest melodic vocal work in ages. "Dangers of the Faithless" kicks off with a dirge-like intro of dual harmony guitars and lurching verses punctuated by Bostaph's snare cracks, but those incessant choruses cruise along mightily, Billy leading the charge again. Bostaph's galloping double-kicks propel "Henchmen Ride", Peterson and Skolnick letting loose vicious exercises in staccato picking that schools the youngsters from the current thrash revival, while the Pantera-like post-thrash of "Killing Season" isn't afraid to slow down and swing a little. Skolnick's lone solo composition, "F.E.A.R. ", is dominated by a riff that's almost playful, a subtle hint at the jazzier side of his solo work. Lyrically, the album sputters at times; as good a song as it is, the post-9/11 sentiment of "The Evil Has Landed" comes off as too dated seven and a half years after the fact, while the sentimental "Afterlife" and the moping ballad "Leave Me Forever" end the album on a needlessly sappy note. Musically, there's one significant misstep, as the title track reverts to the death metal of Demonic, Billy's hoarse growl, back yet again, clashing with the rest of his work on the album. Still, for a band to get its sea legs back so quickly after such a long period of inactivity is remarkable. Nine years since their last proper album, Billy and the boys have not lost a step, and just like 1990, Testament finds itself on the road supporting Judas Priest, this time part of the ultimate geezer-pleaser metal tour alongside Motörhead and Heaven and Hell. They might be well into their 40s, but one has to think that after the encouraging signs shown on The Formation of Damnation, the next Testament album is going to be even more of a career rebirth. If they can manage to record it before 2018, that is.